Tom chose the Palladian Bridge in Bath's Prior park as the perfect backdrop to surprise Sarah! Tom selected a beautiful Round Brilliant Diamond and our contemporary Abbraccio in 18K White Gold when he surprised Sarah and proposed on the Palladian Bridge. Inspired by the Italian word for Hug and Protect. 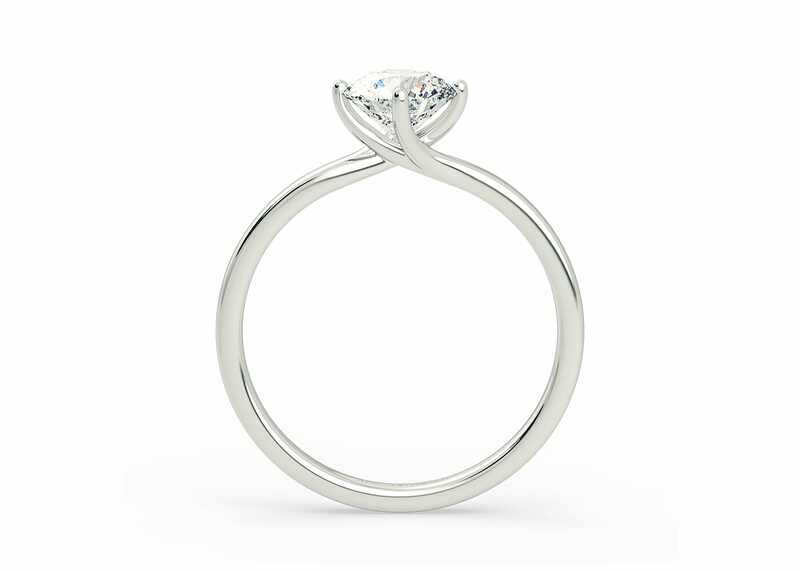 Abbraccio features Four Claws that twist to secure the Round diamond at compass points. The delicate prongs are positioned to maximise light passing through the diamond and produce the most exquisite sparkle. "Fantastic service and attention to detail. Learnt a lot about the product and delighted with the final result. Would recommend to anybody and we will be back for our wedding bands! Excellent product, service and turnaround." The Abbraccio allows your diamond to take centre stage, which diamond you choose is entirely down to your preferences... Here are two recommendations, both Just under the 0.5ct mark, both gorgeous diamonds, but we have "tweaked" the diamond criteria to give you an ultra premium diamond, and another fabulous option that is easier on your budget.